New Orleans, LA (February 7, 2017) – The Salvation Army is already serving in one of the hardest hit areas near New Orleans as storms dropped several tornados around noon Tuesday. 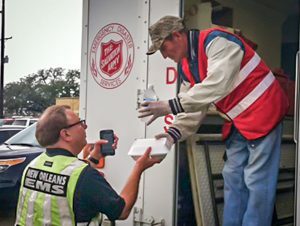 A canteen (mobile feeding unit) was dispatched to Chef Menteur Highway and Wilson Road in New Orleans to serve food, drinks and snacks to residents affected by the severe weather, but also to many first responders on the ground. “We want to be there to help and serve those who are aiding residents who potentially lost everything in this storm,” said Major David Worthy, Commanding Officer, The Salvation Army New Orleans Area Command. Disaster workers are also assessing damage in other areas of South Louisiana to see if further mobile feeding units will be needed. Currently, six parishes in the state received damage.